​I recently attended the Mayo Clinic's continuing medical education seminar on Collaborative 3D Printing in Medical Practice. I have been closely following the news on the early efforts to adopt additive manufacturing (AM) techniques in the hospital setting and have recently sensed an uptick in the frequency of use (and frankly the utility) of the technology. One of the best features of the conference was that the speakers were so thoughtful, unmistakably enthusiastic about 3D printing and its value, and were open to sharing their time and considerable experience with the attendees. There are some amazing things being done using 3D printing by the surgeons at the Mayo Clinic and other institutions around the country. There were several times that I was sitting in the audience thinking, I don't follow national surgeon rankings, but I know this person is the Michael Jordan of what they do. While 3D printing in the medical context started out helping doctors visualize surgical cases that were truly corner cases (like the separation of conjoined twins at the Mayo Clinic), there is also much evidence that more routine surgical procedures benefit from the fact that 3D imaging and printing allows for the creation of patient-specific visualization tools, surgical guides, templates and as they would say in the carpentry world "jigs." I will discuss some of those clinical applications below. I received a robust and interesting response to my post on consolidation in the 3D scanning industry. I would like to follow up on that discussion by describing how I now see that consolidation eventually happening. I predict that there will be one or more companies with a national footprint able to provide high quality, value-added 3D imaging services to its customers in the next five years. Here is how it will happen. ​Because the 3D scanning industry lacks a company with a nationwide footprint, two partners and I proposed to do a roll-up of key industry players to combine their differing strengths and talents and consolidate their modeling efforts to make a stronger, farther-reaching scanning services provider. I believe that there is a strong case to be made in favor of such consolidation. Please read on about that business case and see why that strategy hasn't worked to date. I have been working with the Ricoh Theta S for the last several days since it was delivered. I want to share what I have learned about what it can do. As for these 360 degree cameras, it's funny, I regularly see people referring to 360 cameras as "3D VR" cameras. There also seems to be a general nomenclature ambiguity about VR surrounding the format and whether certain VR experiences are 3D. I will discuss in a future post the different flavors of reality capture, among them and along a spectrum: 2D panoramic, 360 panoramic (still 2D), 3D stereoscopic, and real 3D (like you experience in a game engine). For now, it is enough to note that the Theta S generates a 360 degree two dimensional photo sphere permitting you to simply take a picture and afterward look in any direction you like. It can take still images as well as 1920 x 1080 video. "Star Trek Replicator and 3D printer" by Shisma - Own work. Licensed under CC BY-SA 3.0 via Commons. This may not come as a surprise but we simply don't have anything like the Star Trek replicator today. In Star Trek a replicator is a machine capable of creating objects. Replicators were originally seen used to synthesize meals on demand, but in later series they took on many other uses. What we have today might be called a "replishaper," but there is so much more to creating an object you want to use than simply its shape. This post talks about what is left to do before we have the ideal 3D printer. There is pretty much no way for me to say that the Hyperloop has anything to do with my 3D blog. I don't care. This is one of the coolest technologies going and since it will be happening in 3D space, I'm going to count that as good enough. So, what is the Hyperloop and why should we be interested in it? Read on and see why this idea is crazy enough, it just might work. This post will explore the back of the envelope business case for the hyperloop and argue that we are ready to move on to the next step in testing it's economic and practical feasibility. Because I have now been blogging for a little over a month, I'm starting to become aware of new technologies I never before knew existed. One of them is known as platform blogging which sometimes goes by the relatively unfortunate name of "plogging." One of the new entrants to that game is called Medium. It is intended to be a place where a number of different voices can be heard and to some extent curated. It should give the effective blogger additional visibility. I'm all for trying new things when it comes to technology, so I will be posting the High Tech Tomorrow content on Medium as well to understand how that community works. How does that affect you? Not at all. If you want to keep coming to www.hightechtomorrow.com you can. I will post here primarily and first. But if you happen to be at Medium reading other articles, then you'll be able to see my work there as well. Like my work there (if you do) and I may rise up above the technology noise. I would like that. To be honest, I have been there for about three weeks and I have no idea how anyone sees any of my articles. A couple of the articles I have posted there have been read and one was recommended, which resulted in a few people following me, but some articles haven't even been viewed, much less read. It is not self-evident how you get read for the first time on Medium. I have had the same experience on Googleplus, I haven't figured that one out yet either. For those of you thinking of writing your own blog, I am currently finding that I get the most traction by putting my posts up on LinkedIn, which sends the readers back here. I get the most traffic from LinkedIn. This whole blog thing is a grand experiment, one that I have been enjoying immensely and learning from, so from time to time I will let you know how it works out on these sites. You may find it interesting that I have had 809 unique visitors to this site in the first six weeks and a little more than 2,000 page views. I have no point of reference as to what I should expect so I am going to take those numbers as a good thing, particularly in light of the kind of esoteric subject matter I'm writing on and the fact that this blog has given me the opportunity to have some great conversations with several of you. If you get a chance, let me know what you think. I'm all for hearing how I can improve this blog. Google's detailed 3D flyover of Hong Kong in Google Earth highlights a developing trend that will accelerate as more and more reality capture takes place and we start to fill up a digital world that mirrors the real world. See Google's A bird’s eye view of Hong Kong. The 3D virtualization of the real world is going to simultaneously make our collective understanding of the world both smaller and larger. That comes with some really cool upsides and a reason to reflect on one extraordinary cause for consideration. I'm guessing that most of my readers have no idea what this title means. Read on and I will explain how this alphabet soup represents a continuing revolution in the business of orthodontics and the way we improve our smiles. Dentistry and orthodontics is one of the industries that 3D printing is changing right now and will transform even more in the future. We are now starting to read stories about flagging demand for consumer 3D printers. See 3D printing is a cool, futuristic concept that's not making a lot of money by Seth Fiegerman recently in Mashable, Business. Nonetheless, right now on Kickstarter alone, there are more than fifteen 3D printers you can help fund. Are we experiencing irrational exuberance by the 3DP start-up community? To some extent of course the answer is yes. But more precisely, I think what we are seeing is the natural ride along the Gartner Hype Cycle and an interesting new phenomenon where the tech-interested community pitches in to help fund new tech ideas via crowd-funding. ​Will most of these companies be around in a couple years when the field settles out? I doubt it, but that doesn't mean that they aren't bringing real value to the industry. Many of these companies are bringing one or more innovations to the 3D printing process and in the aggregate are making the prospect for future adoption greater. But why aren't consumers buying 3D printers at the level we forecast? Ten years ago if you wanted to fund a technology business idea you either had to have rich parents, be willing to live on Ramen noodles for two years or be able to persuade a bank or investors to loan you money (see rich parents). Since then there has been a very interesting phenomenon that allows thousands of more ideas to get funded with minimal hassle, vetting or paper filling out -- crowd funding. On sites like Kickstarter or Indiegogo (there are a number of others), all the aspiring technology entrepreneur needs is a video camera, a plausible idea, enthusiasm and a little luck to pre-sell their first 100, 500 or in the case of the Pebble Time smartwatch, first 78,471 units. Indiegogo claims to have raised approximately $210 million for technology projects. Kickstarter, which funds artists, musicians, filmmakers, designers and other creators including technology projects has raised $2 billion. These are just two of the most active crowd funding sites. I think that it is safe to say that crowdfunding is starting to be a real alternative funding vehicle for certain types of projects. The best projects seem to be those product ideas that are pretty mature but that require some modest investment (but above the financial capacity of the entrepreneurs) usually either for tooling or some other component of the initial manufacturing process. So, is this trend a good thing? There are a whole lot of professional photographers out there, somewhere in the vicinity of 140,000 according to the U.S. Bureau of Labor Statistics. Nearly all of them take two dimensional pictures. I believe that is going to change in the next couple of years. I am not talking about the 3D selfies that several companies are now producing. Those will have their market, but I believe there will be significant growth in the area of 3D product photography. This post will be another one of my back of the envelope business cases for this new business opportunity. Here is my hypothesis: the digital world is moving rapidly from 2D to 3D. In light of that transformation, I expect that there will be an increasing demand for 3D images to be used in games, 3D printing, VR and AR, marketing and general communication. Someone will need to fill that demand. I submit that we have not yet seen the best in this category and that there is still room for additional entrants. This post discusses the obstacles and opportunity in the business area of 3D digitizing the world. We need a simpler approach to CAD design. First time CAD users have to learn a complicated set of actions to even begin to be able to draw an object. The problem with CAD programs is that they all seem to start from what the CAD program wants to do (draw lines and shapes like cubes and cylinders) rather than starting from the picture in the user's mind. If you do a lot of 3D printing, you will experience continuous challenges with this approach. First, many people do not draw well. Second, most are not fluent in CAD. Third, most people don’t want to spend months becoming fluent in CAD. They do nonetheless want to be able to create objects, express their ideas visually and 3D print some of them. I believe there is a big universe of people who would like to draw / make / create, but who can't because of these challenges. I suggest that we approach the problem by turning the system on its head, by starting with what the user has in mind. Translate the picture from their mind and their words into language that the computer and CAD program can understand and manipulate. Importantly, to speed up the process, start with a 3D object that serves as a template or jumping off point. I call that template a "digital analogue." I really like that term, which probably says a lot about me. I was an in-house lawyer for 20 years. Among other areas, I worked with product development folks who created new products to bring to market. Over the last several years, I have worked individually and with teams on developing a number of new technology products and service offerings that I wanted to bring to market myself. Based on that experience, I have some observations about how to go about the very early idea phase of bringing a new product to market. What is a "Back of the Envelope" (BOTE) business case? I think of the BOTE business case as the absolute minimum effort that should be undertaken before launching a new product or business enterprise. What are you trying to accomplish by creating a BOTE business case? Several things. First, you want to know that there is no obvious reason that your business idea won't work. Second, you need to know that there is at least some prospect for profitability since you can't sell forever without making money. Finally, you need to have a sense of what the competitive landscape looks like since you will be a participant in that market trying to sell your product against what is already there. Occlusion Preclusion -- A Fix Needed for Live Action VR? I can't wait to watch football on a 360 degree immersive VR headset. NextVR of Laguna Beach California says that it has developed a custom "lens-to-lens system for capturing and delivering live and on-demand virtual reality experiences in true broadcast quality." How great will it be to be able to watch a play unfold while virtually standing in the pocket and seeing everything the quarterback sees? If you are defense-oriented, then you will want to stand where the linebackers line up and see the game from their side of the ball. Live action streaming VR cameras will be set up in a calibrated array around the stadium. Among the many technical challenges that must be overcome to make a VR broadcast happen, including real-time stitching together of the many cameras' images, there is one challenge that I have not seen addressed yet. The problem is know as occlusion. This product concept is one of the most challenging and fun ideas I have explored. It will require exponential progress on a number of technical fronts, but it could open up a whole new way to tell stories and to communicate ideas. The basic idea is to turn the words of a novel (book, play or film script) into a movie using an AI system (e.g., IBM's Watson), natural language processing, automated (or accelerated) avatar generation, text to speech, and automated machinima / animation techniques. Watson reads the book, Watson generates a movie. I will necessarily be using some shorthand to describe this business concept, so forgive me where the explanation sounds too simplistic. It either means I don't know what I'm talking about or that I have chosen to write at a high level to accommodate the limits of a blog. You can choose as you deem appropriate. Categorization of story components. Parse the text via natural language processing (NLP) techniques to categorize each word, phrase and/or sentence as being related to (1) dialogue, (2) character description, (3) scene/setting, (4) objects/props, or (5) action. The first generation approach can be simplified by using TV / film scripts or plays. Character generation. Start with baseline human form, customize using text-based descriptors. First generation -- either automate an existing avatar generation software or select from library of existing avatars. This post is one in a continuing series of tech-based businesses that are coming, just a question of who will get there first. Large industrial (and to some extent smaller) manufacturers share a problem with their customers – the customer needs quick, affordable access to replacement parts but does not want to have to store those parts, sometimes for decades, to ensure ready access when the need arises for critical equipment. For example, in a heavy industrial setting, such as a large energy producer, the customer whose facility is offline may lose as much as $1m per day waiting for a new part. To protect against that contingency, many choose to carry a large inventory of spare parts, for which the company incurs significant costs such as storage, maintenance, and even property taxes on the inventory assets. In addition, expensive equipment retirement decisions are at times forced due to the lack of available replacement parts. Just as their customers do not want to store 25+ years of spare parts, manufacturers need to either store the parts themselves or the tooling, molds and casting equipment and materials to fabricate the parts over time. In some cases, the casts have long since been lost or destroyed. 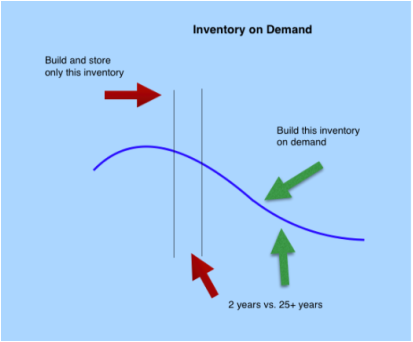 The inventory on demand concept is designed to address these problems. Use manufacturers’ CAD/CAM drawings or scan their parts (using scanning/metrology equipment) and fabricate those parts as needed using a machine shop including, where appropriate, 3D printing. In other words, store some minimal level of inventory and fabricate to replace periodically as used, minimizing unused, carried inventory. The inventory on demand concept could also be called "just in time manufacturing." I miss the old LinkedIn Pulse. Recently, in an ill-advised attempt to free up some storage space on my iPhone, I deleted the old Pulse app thinking that I would bring it back up after I had finished videotaping my son's baseball game. Well that was a mistake. I came to find out that my old LinkedIn Pulse app was grandfathered through the end of this year but that there is a new Pulse in town and I was told it was better. That is not true. This Pulse is now a curated shell of the old vibrant app. Back when I was at VeriSign, we had a very similar product which was new at the time, a newsfeeder service that allowed you to crawl the web and find just about any news article that you wanted based on the type of news that you liked. It was ultimately done in by, among other things, a lawsuit brought by one of the large news services who rejected the company's fair use defense. I always wondered how the folks at Pulse had managed to deal with that issue. I wonder now if they ultimately didn't and that's why we now get this curated mini list of articles that LinkedIn wants me to read. That is not at all what I want. I like flipping through the old Pulse, which is still on my iPad, to decide which of the many articles from my various favorite web sources I want to read. That gave me the sense that I was choosing where to focus my reading time and gave me so many more options than I get now. Frankly what's left barely has any pulse left at all. I'm always looking for ways to get things done more easily. I turned that desire onto a project that needs a photorealistic 3D environment. Thinking that with all of the scanners and high res cameras out there, there must be a straightforward way to pull a real environment (think a room, set of buildings or beautiful mountains) into a 3D game engine, such as Unreal or Unity. Turns out I was wrong. I looked at over 30 separate hardware-based approaches, [See my recent post entitled Putting the Reality in Virtual Reality] and none of them would do exactly what I wanted. In the interest of moving the discussion forward on this topic -- How can you pull reality into a 3D game engine? -- I am offering my list of the elements of an ideal reality capture system. I am all for hearing your comments. Field of View. The captured field of view (FOV) is 360 degrees horizontal and vertical. Photorealism. High resolution and high dynamic range color and quality. Directional Audio. Sounds maintain their expected position as you turn your head. Depth Info Capture. The accurate geometry of all objects in the field of view is captured. No Simulator Sickness. The system does not induce a sense of nausea or motion sickness. Game Engine Compatible. The system output may be used in a game engine like Unreal or Unity. Post-processing. The system requires minimal (or simply real-time) post-processing to be viewable. Computationally efficient. The system output can be viewed on a Mac/PC or is capable of being decimated to accommodate game player level tessellation. Web Standards Compatible. Compatible with current web standards, like WebGL, etc. Affordable. Capture device and software costs less than [$10k]. Occlusion Minimization. The system includes a robust occlusion minimization methodology/strategy. No Image Distortion. The system does not create problems due to parallax, equirectangular views or other unnatural visual cues that detract from presence. There are at least six major types of reality capture system out there now: 2D panoramic, 2D spherical, photogrammetry, 3D stereoscopic, light field array, and LIDAR mesh with an HDR photo overlay. Former commercial lawyer. Now I work in the 3D world. Check out the Reading Room for curated links on the topics that most interest you.